I cringe every time I hear the words “private kitchen.” The concept dates back to Qing Dynasty when an aristocratic family in Beijing lost their fortune and had to make ends meet by opening up their home and serving paying customers home-cooked meals. Private kitchens became popular in Hong Kong in the late 1990s and began popping up in office towers and even apartment buildings all over the city. They boast authentic regional cooking from Cantonese and Shanghainese to French, Italian and fusion cuisine of every combination. So far my private kitchen experiences have been invariably disappointing: the food tastes amateurish, the presentation is overdone and, because they often can't afford a full kitchen staff, timing is always off. Because private kitchens are considered one-of-a-kind and the setting is more intimate, they are popular among middle-class restaurant-goers who are willing to pay a premium for something different. Alas, private kitchens are so popular for birthday celebrations that the original intention to tread the unbeaten path is completely lost. When everyone tries to be different, they all end up doing the same thing. That happens a lot in Hong Kong. One of my best friends Victor had his birthday dinner earlier this month. Surprise, surprise, the person tasked with organizing the event picked a private kitchen. 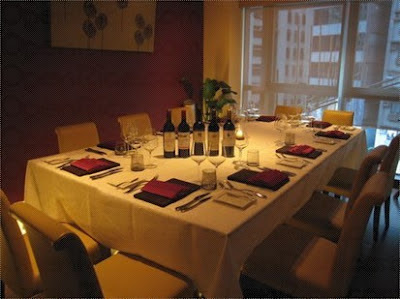 Twyst is located on the 8th floor of the Pemberton Tower in Sheung Wan. To make this skeptic even more skeptical, the restaurant serves Italian food. Pasta and braised meat may sound simple, but they are hard to perfect. With all that weighing on my mind, I walked into the restaurant with managed expectations and slight trepidation. There were eight of us and we were given our own corner room. It was a comfortable setting with the coziness of a friend's dining room. We brought our own wine and cake and the restaurant waived both the corkage and cake-cutting charges. Victor and his wife had a three-month old in a bassinet and the infant was as well-behaved that night as the restaurant was accommodating. There was a generous side table to put the baby and extra bottles of wine. Overall, the waiting staff was helpful and friendly. The four-course meal opened with grilled baby quail and pan-seared foie gras. It was a strange combination, but it wasn't bad. Then came the prawn ravioli, which tasted more like wonton stuffed with shrimp. Where I come from we call that gar gow (蝦餃). My main course was lamb tenderloin with baby carrots but the meat was cold, which confirmed my suspicion that private kitchens lack a good handle on timing, especially when serving a large party and each guest orders food that cooks at a different pace. The lamb also came jus-less, which was an indefensible miscalculation. European cuisine is all about the sauce and not making one is equivalent to watching a film without the soundtrack. Dessert was the obligatory tiramisu and there was too much lady finger and not enough mascarpone for my taste. 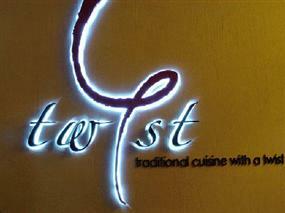 The food at Twyst was passable. 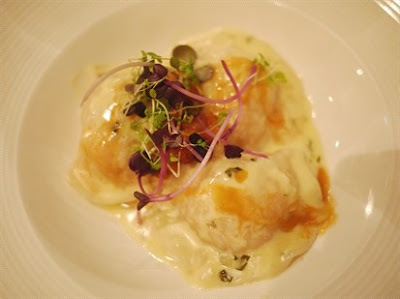 It was Italian cooking with a Cantonese twist. On that account, perhaps the restaurant is aptly named. It also confirms everything I feel about private kitchens: hyped up, trying too hard and always over-priced. But despite all that, I had a wonderful time that night. It goes to show that it really is the company that counts. OK, "not to be missed" (you know how I interpret it). Will grab my bite elsewhere. We went last week and were happy with it! I had my birthday party there, three years ago. Food was ok but the service was bad. They practically threw us out at 11pm on a Sat.....and rushed through the whole thing....but you are right, its the company that counts and I had a memorable bday!